Every once in a while there is an oppor­tu­nity to do some­thing that seems like a good idea, but for a vari­ety of rea­sons — maybe cost, time, or that gut feel­ing say­ing ‘don’t bother’ — you decide against it. We almost decided against this, but some nag­ging feel­ing con­vinced us that this could be some­thing big. So let’s start the story. 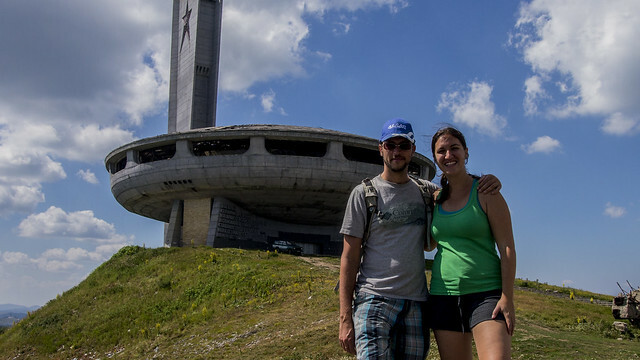 We had caught wind that one hos­tel in Veliko Tarnovo oper­ates a tour, and I use the word tour loosely because it isn’t exactly con­ven­tional, to visit a build­ing that sup­pos­edly looks like a UFO. 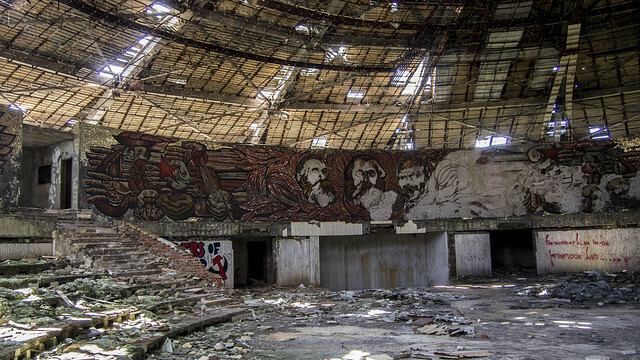 The build­ing was con­structed in the Soviet era, and today it is aban­doned, looted, and rot­ting away. 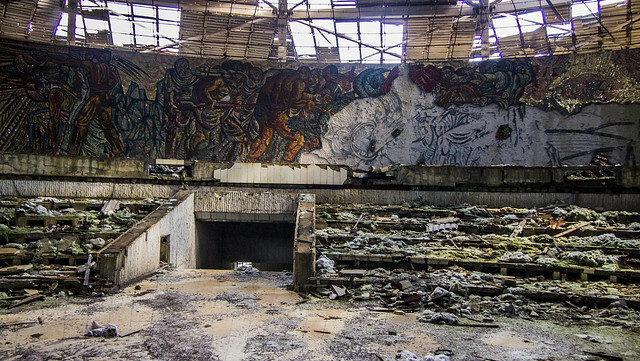 It isn’t an offi­cial tourist site, nor is it even legal to explore the inside of the building. 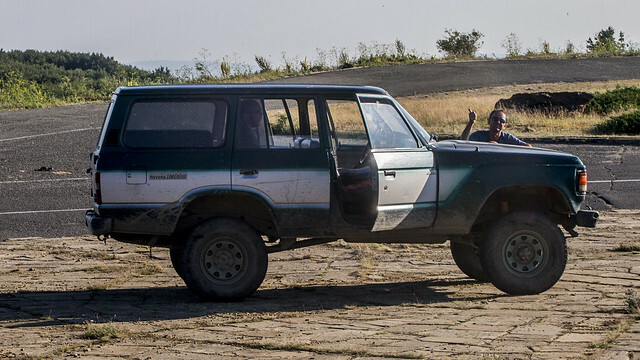 The day began with us get­ting into a 4x4 with two other pas­sen­gers, a Ger­man guy and an Aus­trian girl. The dri­ver, whose name escapes me right now so let’s call him George, was from New Zealand. He had vis­ited the site hun­dreds of times over the last few years. Dur­ing the drive, he explained the story of the build­ing, piec­ing it together from word of mouth and what­ever evi­dence he has seen left­over on site. Bul­gar­i­ans are not proud of the UFO, so no offi­cial infor­ma­tion about it exists on site. 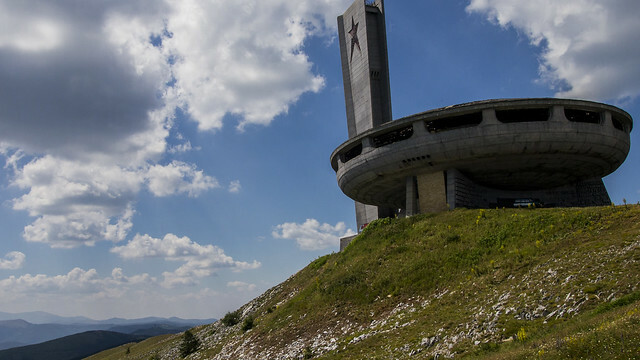 Many believe it rep­re­sents a colos­sal waste of money, con­sid­er­ing the build­ing was only used for 8 years before the Soviet Union col­lapsed. The build­ing was intended to be both a sym­bol of com­mu­nist strength, as well as a con­fer­ence cen­ter for high rank­ing party officials. He also shared recent expe­ri­ences that added a kind of rebel­lious­ness to the adven­ture, includ­ing how he once he saw a famous graf­fiti artist tag­ging the build­ing, or the time the police showed up and took his plate number. “Hang on!” George exclaimed. We sud­denly went from talk­ing about this mys­tic build­ing to bounc­ing in our seats. “Aaaaah!” The Aus­trian girl screamed, when she saw that we were about to drive into a ditch. George pushed the pedal to the metal and con­tin­ued to drive up a forty five degree angle hill. We were tak­ing a short­cut that the Sovi­ets con­structed through the woods. Helene and I bounced in the back seat, hold­ing onto the 4x4’s ceil­ing straps so we didn’t get thrown into each other. It felt like we were on a roller coaster. I was hav­ing so much fun dri­ving through the woods that I couldn’t help but won­der if the build­ing would have been as excit­ing as the ride to see it. Once we approached the build­ing we stopped to take some pho­tos. 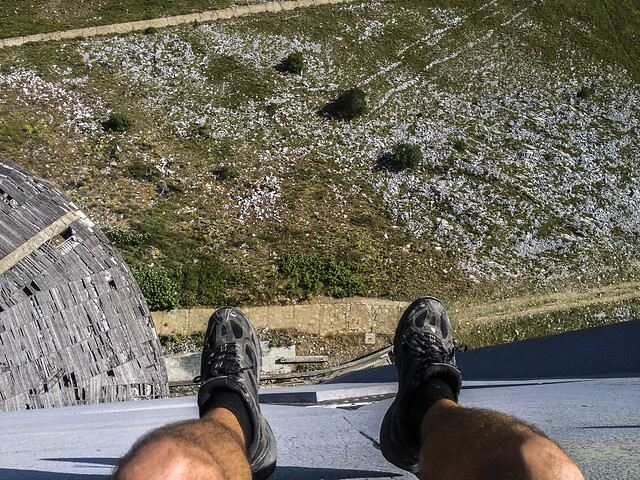 Perched atop the moun­tain, the build­ing cer­tainly was mak­ing a state­ment. As we got closer, it was clear that the build­ing met the def­i­n­i­tion of aban­don­ment: bro­ken glass every­where, locked up doors, and a story to tell. The main entrance was con­vinc­ingly closed off to vis­i­tors with metal bars and a pad lock. Towards the side of the build­ing was our entrance which was basi­cally a hole where a vent was once installed. We awk­wardly climbed through the open­ing try­ing not to cut our­selves on the jagged edges, clearly not con­fi­dent that this was a good idea. 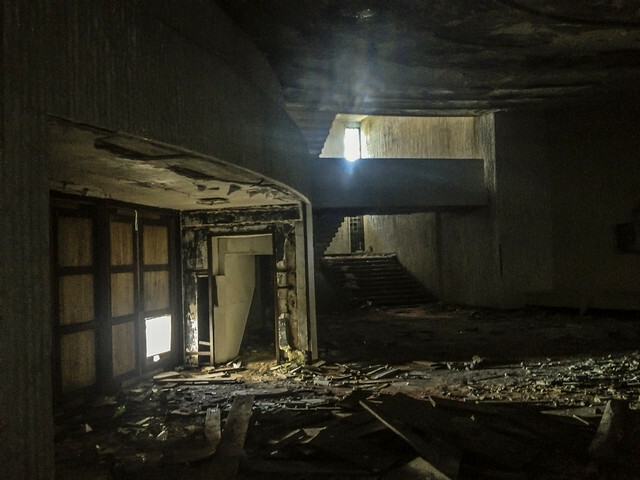 The inside of the build­ing was dark, musty, and dusty. The building’s mar­ble floors and stained win­dows that would have char­ac­ter­ized its grandeur had been looted and were now dimin­ished to rub­ble and shards of glass. 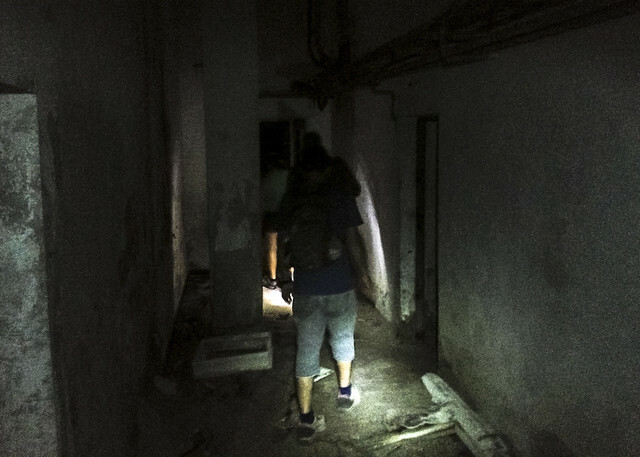 With our head lamps we explored dark cor­ners of the building. Bro­ken porce­lain was all that was left of the bath­room. Dan­gling cables was all that was left of an ele­va­tor. Rem­nants of red vel­vet was all that was left cov­er­ing the walls. 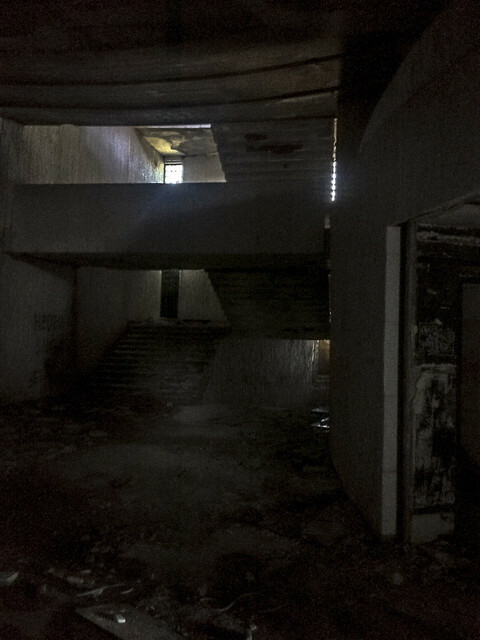 We ven­tured upstairs to explore the con­fer­ence hall. 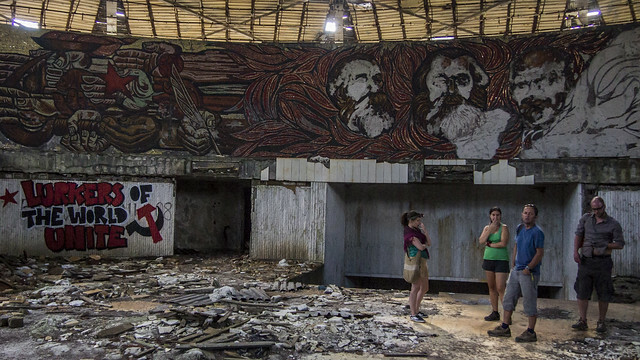 We entered the room and the fathers of communism’s faces looked down upon us in the form of mosaics that encir­cled the hall. 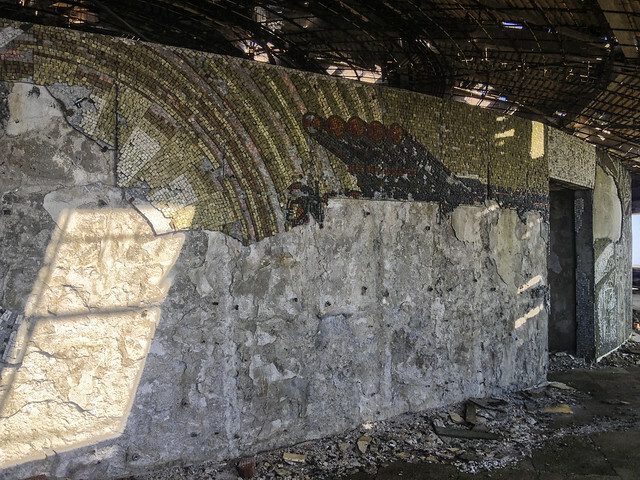 Much of the mosaics were start­ing to decay, or were destroyed by the ele­ments. Entire sec­tions laid on the floor. Enough detail remained for your brain to fill in the blanks, leav­ing an impres­sion that the room was once, indeed, grand. Sur­round­ing the con­fer­ence hall was a cor­ri­dor cir­cling the build­ing. 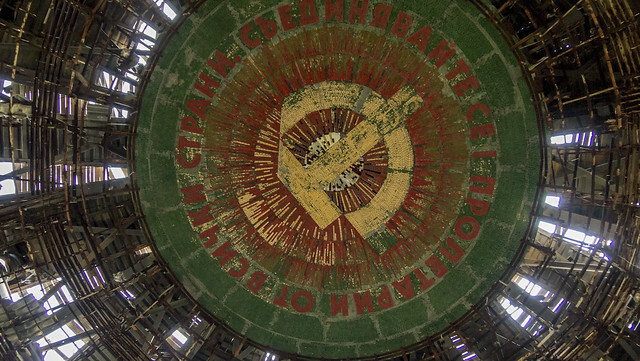 Walk­ing through the cor­ri­dor was also a site to see. 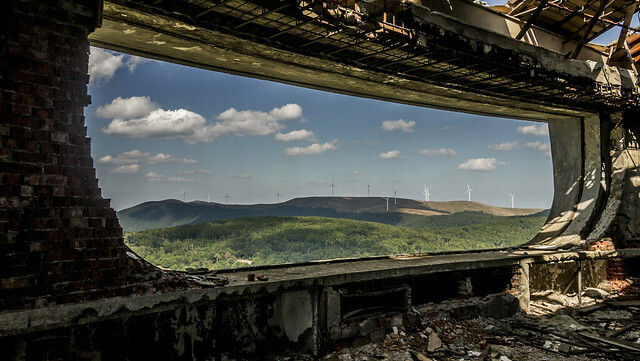 To the left were win­dows over­look­ing the moun­tains. Even the glass that filled the win­dows were either looted or shat­tered on the floor. 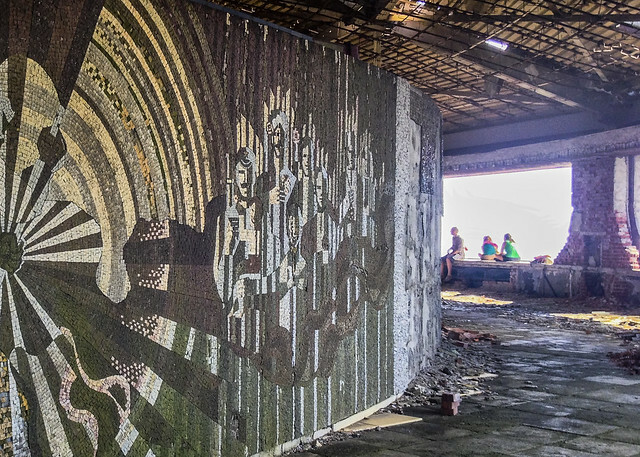 To the right, more mosaics depicted every­thing from cap­i­tal­ist demons to com­mu­nist work­ers doing an hon­est day’s work for the state. Adja­cent to the con­fer­ence hall was the building’s tower. 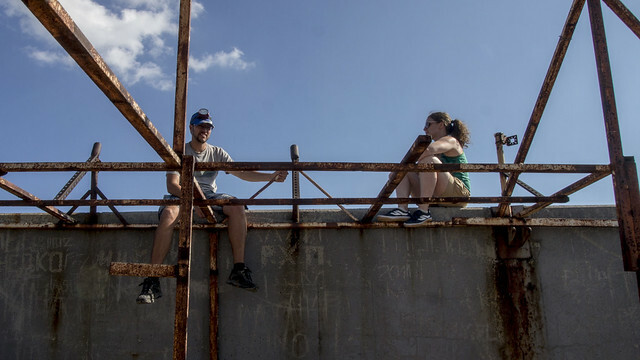 We climbed to the top of the tower through the fire escape, which was lit­tered with empty beer cans. 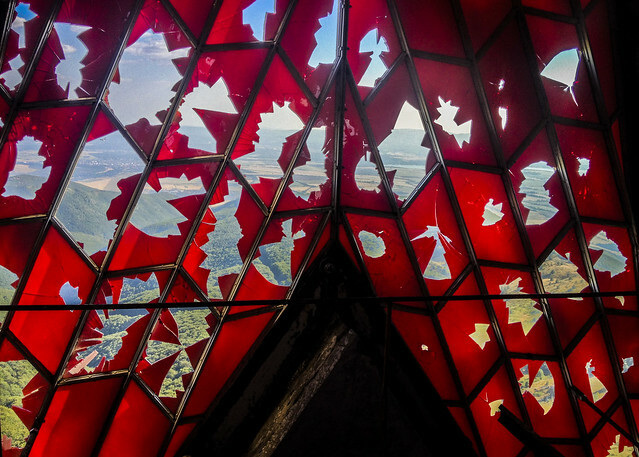 Some fif­teen floors up, George pointed out that the red stained glass com­mu­nist star had holes in it, holes that weren’t there the last time he vis­ited. 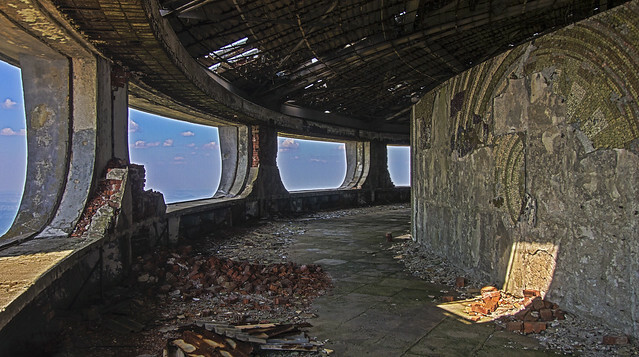 I had a feel­ing the next tourists who would visit would see the UFO a lit­tle more run down than we did. More clues along the way showed that the tower’s elec­tric­ity was pow­ered by Cisco, and of course the cir­cuit board and wires had also been stolen. 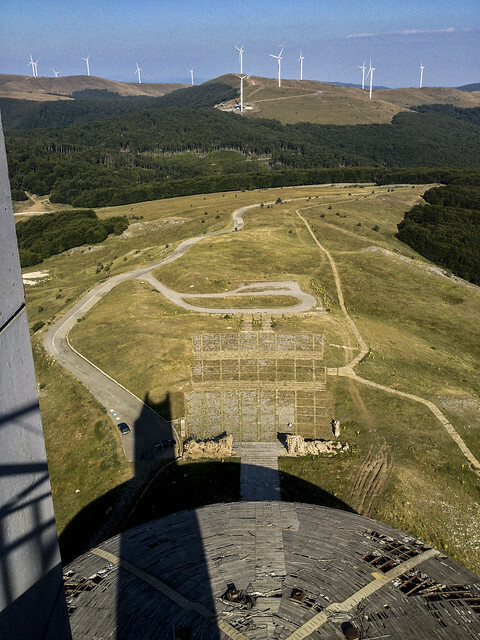 Get­ting to the top of the tower rewarded us with a 360 degree view of the moun­tains. 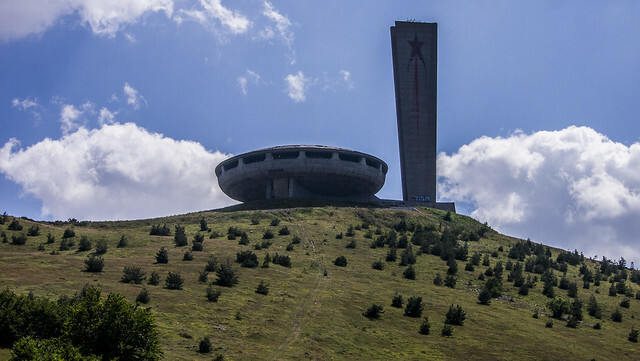 The fresh moun­tain air cooled us down after the hike up the tower. We sat up there and relaxed. In real­ity, the whole expe­ri­ence, while excit­ing, was quite sad. I’m not sure if the declin­ing state of the build­ing rep­re­sents a con­scious effort to for­get the past, or is a reminder that the cap­i­tal­ists won. Per­haps it just means that there isn’t enough money in Bul­garia to pre­serve some­thing like this. 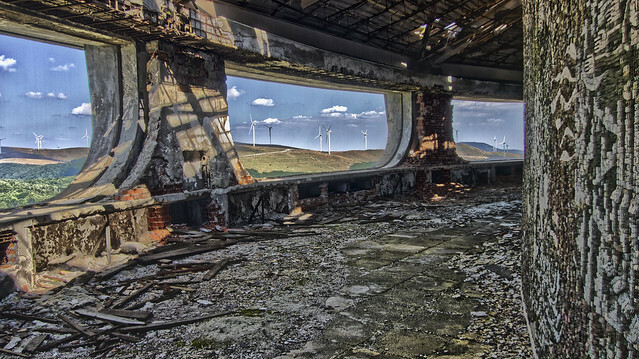 Clean­ing up the mold and asbestos alone wouldn’t be worth the lia­bil­ity. 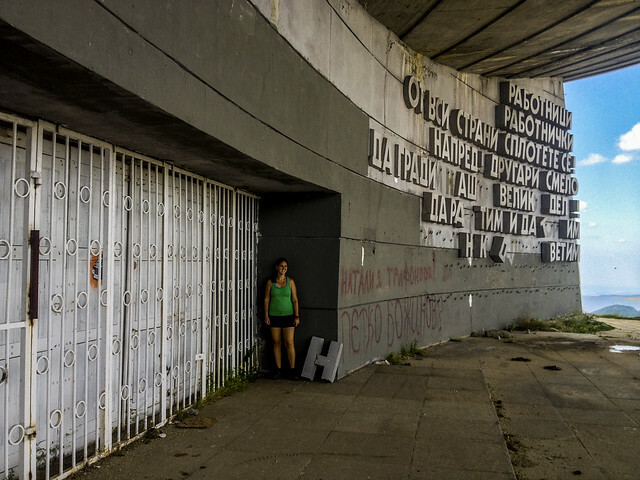 Maybe the mes­sage here is some­thing as sim­ple as this isn’t an impor­tant part of Bulgaria’s rich 5000 year history. After three hours, or so, we were fin­ished with explor­ing the build­ing. 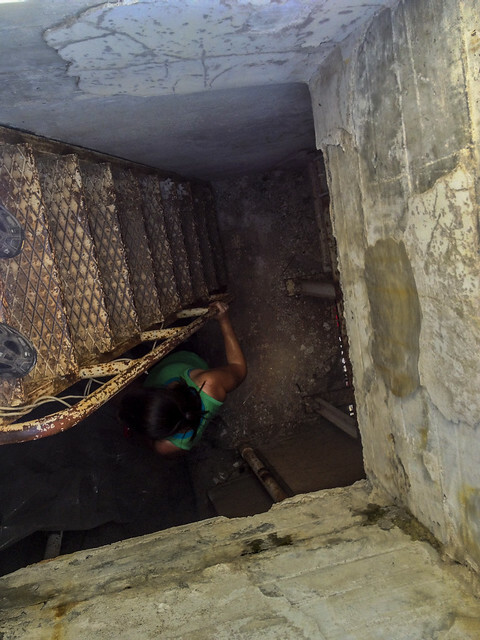 As we exited the crawl space, we did so with a much more assured sense of con­fi­dence. 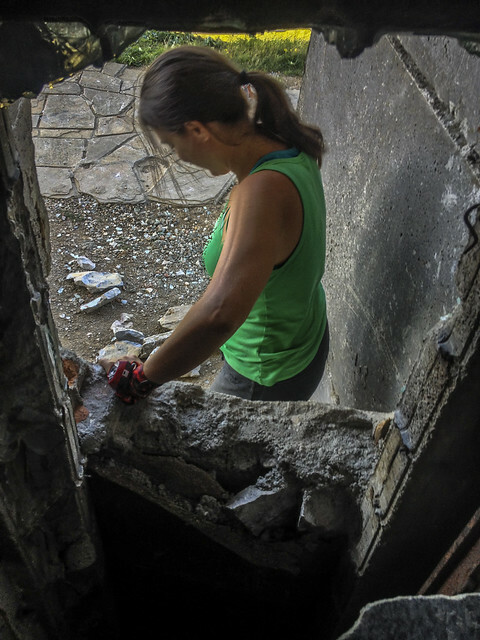 While we were exit­ing through the crawl space, three Bul­gar­i­ans and their lap dog were walk­ing near the build­ing with the same awe struck faces we had some three hours ear­lier. It was clear they didn’t know where to enter, so we gave them some friendly advice and returned to the hotel. I’m not sure if I would have appre­ci­ated my visit if the UFO if it were roped off like most tourist sites are. In a way, the story is more telling with­out sig­nage. The whole expe­ri­ence raised more ques­tion than it answered, a sign of some­thing truly amazing. 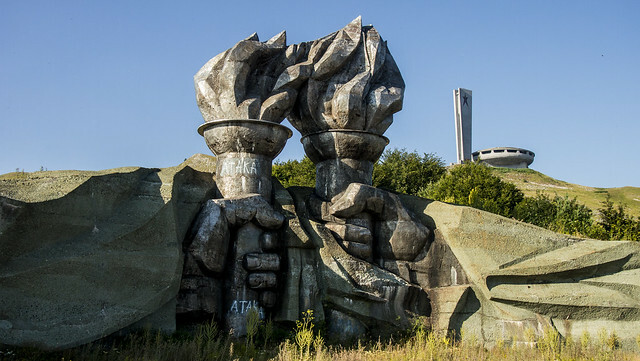 This entry was posted in Articles, Bulgaria, Tim Fisher on 6 October, 2013 by Tim Fisher.